All right, ladies and germs, it's time to ring in the new year with a brand new podcast. "Episode 3: Your Ace From Outer Space" is now available for download. The other day I was checking out my iTunes page for fresh feedback (something I do like, 6 times a day) and noticed that there was a brand new review from a user signed in as "Urb Magazine." I thought that this was pretty awesome because I used to be a big Urb reader back in the day. And in an amazing coincidence, I actually bought a new copy of Urb Magazine for the first time in almost 4 years that very morning. I was intrigued by the cover featuring Justice and Wale. Incidentally, both Wale (American-born rapper of Nigerian decent, pronounced "waah-lay") and Justice (French DJ's….. um, "joos-teece"?) will be appearing in future podcasts. Anyway, back to Apple user ID "Urb Magazine," I realize that it's not necessarily someone from the aforementioned magazine. I mean, I don't need to be the 40th President of the United States to sign in as "Ronald Reagan," ya dig? Still, it was pretty cool. I have to admit that while the review was a positive one, I did take slight offense (very, very slight) to the implication that I took the name of my podcast from another (apparently) better known show. Look, I know how all that sounded, but I'm not complaining about the review I got, as I've mentioned many, many times before, I'm grateful for all feedback, positive and negative. And as I mentioned, the review was positive. So.... thanks! One last thing, since I was asked, the title of this month's podcast is taken from an old U-Roy song that almost made the cut. I suppose that I probably should've changed the title but screw it, "Ace From Outer Space" sounds cool. Alright enough of my nonsense. 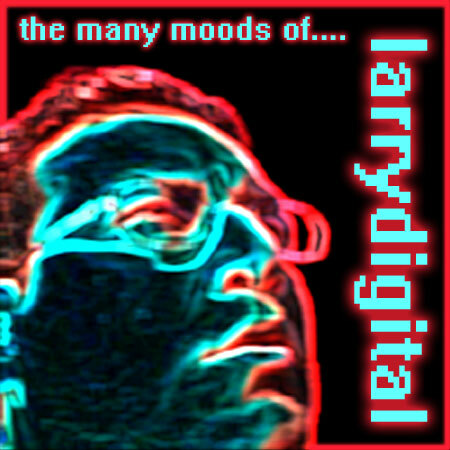 Enjoy the latest episode of the many moods of larrydigital. Wherefore Art Thou, Dancing Barry?